Athletics pitcher Sonny Gray is Thursday's Player of the Day. Gray pitched eight scoreless innings and struck out nine in the 5-0 win over the Astros. It is Gray's Box-Toppers debut, the first time he has earned Player of the Game honors. He is the 3,259th player to debut on Box-Toppers since record-keeping began in 1995. Reds pitcher Tony Cingrani is National League Player of the Day. Cingrani struck out nine over 6 1/3 innings in the 2-1 win over the Brewers. Wil Myers of the Rays is American League Batter of the Day. He went 3-for-4 and drove in four runs in the 7-1 win over the Mariners. Hector Sanchez of the Giants is NL Batter of the Day. 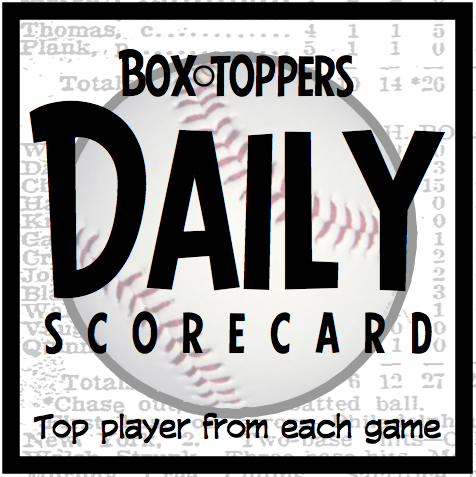 He hit a pinch-hit three-run home run in the top of the ninth inning to beat the Nationals, 4-3.
Notable: Tigers pitcher Anibal Sanchez rose to 18th place in Box-Toppers player season standings after earning Player of the Game honors Thursday. Sanchez (7.1IP 1R 5K W in the 4-1 win vs. the Royals) earns 1.0 Box-Toppers point, giving him 12.7 for the season. Gray receives 2.0 Box-Toppers points for being Player of the Day. Cingrani receives 1.7 for NL Player of the Day. Myers and Sanchez each receive 1.5 for being top Batter of the Day in their league.